Our advanced laser cutting service promises to deliver results of excellent quality, each and every time. If you are looking for a company that offers an outstanding laser cutting service then you have certainly come to the right place. The technology involved in our set-up means that our metal cutting is not only unbelievably accurate, but is completed at a rapid rate too. For this reason we are able to offer our competitive prices for laser cutting services without compromising on quality – making us one of the leading laser cutters in the UK. The laser cutters we use are the fastest industrial CO2 and fibre lasers on the market. 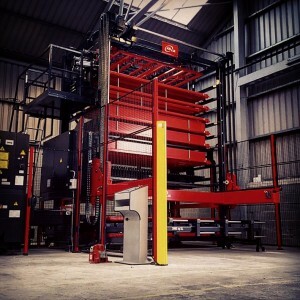 Our fibre laser is also fitted with full automation material handling facilities. This allows us to carry out all tasks with a maximum part size of 3000mm x 1500mm and up to 25mm thick with minimal human interaction! Whether it’s a one off part or a very high volume requirement, we are equipped to offer a speed turn-around. Our machines run 24 hours, 7 days a week, because our laser cutter doesn’t need to be monitored overnight. This means that we are able to accommodate our clients’ needs no matter what the time of day. Furthermore, we are also able to keep our production costs as low as possible by keeping overheads low. Our material handling automation facilities are able to greatly reduce the time it usually takes for changing metal between productions. We don’t need to do any manual changes as the machine does all of the hard work for us. Our laser cutter, with its 7.5” lens, provides some of the fastest and most accurate metal cutting in the business. In fact, it’s so efficient, that our costs are kept low and transferred back to our clients. The linear drive system is fiercely accurate. It can produce parts up to +/-0.1mm on part tolerances and up to +/-0.02mm on positional tolerances. We have no physical contact with the metal during the cutting process. This means that we greatly reduce the risk of marking and distortion during production. The Amada F1 gives a smooth finish and can even give some metals a polished appearance after cutting whilst the Ensis can process materials with fierce speed and cut copper, brass and titanium! Automation tower ready for use. For an accurate and energy efficient method to cut metal, laser cutting offers one of the best possible solutions. Yorkshire Profiles are proud to offer laser cutting services throughout all the UK to a wide range of industries. Not only does laser cutting offer a high level precision to your exact designs and requirements, but the costs saved through its time and energy efficiency are passed onto clients in our services. Here are the answers to some frequently asked questions. I have been using Yorkshire Profiles for a couple of years. They produce both prototypes and batches of both ... laser cut/folded parts for me – I have found them to be prompt and reliable. The quality of the work is good..	Simon, Performance Car Suspension Specialist. Good quality products with a fast turn around time – also helpful when developing new products. Alex, Manufacturer of Flexible Hose Assemblies. We provide a high quality nationwide laser cutting service using the latest in sheet metal laser cutting technology. The history of laser cutting began shortly after the discovery of laser technology, developed at the end of the 1950s by Gordon Gould, Charles Hard Townes and Arthur Leonard Schawlow. This was based upon successfully attempts to concentrate radiation emission of visible light, and the discoveries were published in the 1959 by Gould titled THE LASER, Light Amplification by Stimulated Emission of Radiation. Laser cutting works by finely directing a laser beam onto a material surface for cutting or engraving. A beam that's emitted from a 'laser tube' is focussed by the use of several mirror reflections sending the beam up towards to 'laser head' in a similar fashion to a periscope. This leads to a lens that further focuses the beam onto the desired material to cut or engrave. The amount of material cut or engraved by the laser is defined by the kerf. This is the width of cut or groove made by the particular process and will vary depending on the material used. It can also be affected by the laser beam tolerance which determines the initial width of the beam. At Yorkshire Profiles, we have some of the latest laser cutting machines and can offer an incredibly fine tolerance in our machinery. There is a massive history behind laser cutting and the way it has been developed over the last 5 decades or so. Without advanced developments back in the 60's-70's, we wouldn't be where we are today. With that being said, we have a lot to be thankful for! Laser cutting is a perfect solution for both industrial scale fabrication needs and also for smaller more detailed purposes. Since it's development in 1960s, these devices have changed the cutting industry for the better. The versatility and accuracy allows companies from a wide range of backgrounds to benefit from this technology. With the opportunity to quickly have materials cut to precise requirements at a much quicker speed, Yorkshire Profiles are proud to offer this ever improving technology to companies across the UK. You can find out more about our laser cutting services on our services page, or by calling us on 01904 737095.